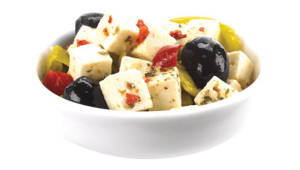 A delicious combination of feta cheese, Greek peppers and authentic seasonings. Great on top of greens, rice and pasta! 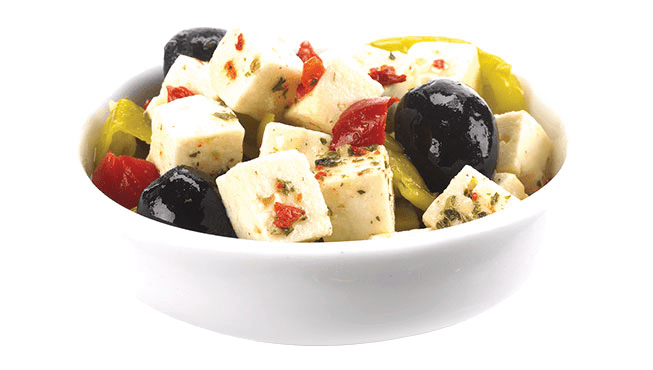 Feta cheese (pasteurized milk, bacterial culture, salt, microbial enzyme, calcium chloride, lipase), canola oil, peppers, ripe olives, water, dehydrated garlic & parsley, seasoning, salt, vinegar, calcium chloride, sodium benzoate, citric acid, turmeric, ferrous gluconate, Sulphites.